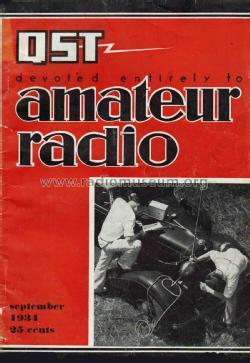 QST is the journal of the American Radio Relay League. The magazine includes articles of interest to radio amateur, including how to build equipment, new technology, pictures of ham shacks, and national and world legislation effecting amateur radio. Of historical importance, the magazine includes schematics of consumer amateur gear, and its many advertisements are a invaluable source of historical information. Click here for the 312 models documented in this literature, i.a.